Change is difficult–leading revolutionary change in large organizations requires overcoming institutional inertia. 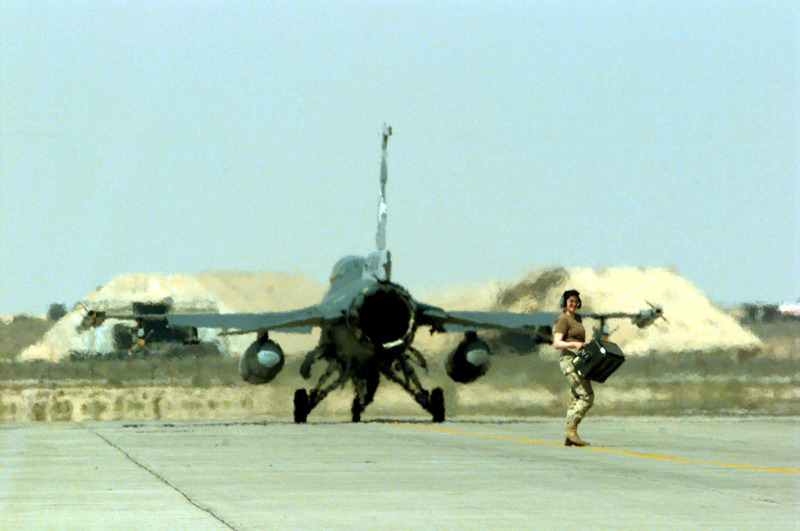 At dusk, I watched four combat loaded F-16 fighters taxi out to strike targets on the first night of Operation Iraqi Freedom as my engineers were affixing the final solar-powered LED taxiway edge lights to the pavement of our desert air base. Had I gotten my way, that might not have been the case. You see, during the planning phase months before I had insisted on a traditional airfield system with wires. I didn’t want to risk the solution my team innovated–too risky. They had found solar-powered harbor buoy lights, and they tried to convince me to buy them rather than going with a traditional design. I turned them down. Fortunately for me, and those F-16 pilots taxiing out on the first combat mission of the night, my team decided to risk my ire and bought a bunch of those buoy lights while I was away for a few days to brief our headquarters on our progress. When I returned, I was upset with them for disobeying me, but in the end their risk-taking enabled us to accomplish our mission rather than my reticence. It’s a lesson I took to heart. “Institutional inertia” is my term for the resistance to change in groups, particularly in larger organizations. In physics, the “inertia” is a body’s resistance to the state of motion. For example, if a body is at rest, you have to overcome its inertia to get it moving. “Institutional inertia” works the same way. It’s the collective weight of established processes, individuals’ self-interest, and even outside stakeholders’ pressure to remain at the status quo. The larger the organization, the higher the institutional inertia, and the harder it is to move that organization in a different direction. In the case of the buoy lights turned taxiway lights, I was the biggest source of that inertia–and when I was gone the team succeeded without me. The challenge for large organizations in the 21st Century is to rapidly respond to changing conditions. Extending the nautical metaphor a bit, it’s like trying to move cargo like the big ships with the agility of the speedboat. Understanding and reducing institutional inertia is crucial to increasing agility. Time to Market for most market sectors is shortening–particularly in the tech and service sectors. One of the reasons we no longer use Blackberry devices is because Research In Motion passed on the opportunity to be an early adopter of the touch screen interface. Google and Samsung, on the other hand, saw the opportunity and despite being a large company, seized the chance to bring disruptive technology into the market. That example is less about capital or marketing, and more about leadership vision and agility. So what was the difference? Examples of companies that failed to recognize and adapt to rapidly changing market conditions are legion, but the reasons for those failures to adapt are usually not because the CEO was a curmudgeon. In most cases large organizations who failed to adapt can attribute that failure to a slow recognition of a changing environment, and a slow response to the change when they finally saw it. Kodak inventing and then failing to adapt digital photography is another example–Kodak once had a camera or film in almost everyone’s hand. Today you’d be hard pressed to find one. Similarly, Swiss watch manufacturers failed to recognize the promise of electronic timing–how could a watch be anything other than gears and springs? So how do agile organizations manage to rapidly adapt to changing situations? Two words: leadership and culture. It’s leaders who create a culture of innovation and agility by empowering people to take risks and make decisions. A corollary to this idea is that senior leaders have to be willing to listen to new ideas, and take reasonable risks by adopting new ideas. Just like my engineering team’s innovative solution to the taxiway edge lights, people need to be willing to present and tenaciously defend innovation. Furthermore, leaders must be willing to step out and accept those risks. When I returned to my desert air base and found out my team disobeyed me, I had a choice. I could have reversed course and forced my own solution after-the-fact, but in the end I decided to accept the fait d’accompli and accept the risk. When leaders allow innovation and accept risk beforehand then organizations can be agile. If agility is the ability of an organization to innovate and take risks, then the measure of an organization’s agility is in direct proportion to leadership’s committment to innovation and acceptance of risk taking. When leaders encourage innovation and reward risk taking, then organizations can rapidly respond to changing conditions. The key takeaway is leaders drive innovation and agility.